The Great Balloon Race are set to release début album Cardboard - the perfect stocking filler for lovers of prog/jazz/folk combinations - and boy is it one hell of a[n alternative] bell jingler. The Cork quintet have been holed up in Cathal Mac Gabhann (frontman of The Altered Hours)'s Cracks in the Light Studio applying the last essential touches to their first full-length recording but the time is nigh for the band to finally introduce the ten-track collection to the rest of the world. Subtle stage-setter 'Animals Burning' acts as a perfect mood-maker, Jonathan McNicholas' shamanic vocals seemingly sung whilst dancing bare-foot around a Mojave desert campfire, buoyed on by Patrick Cullen (bass, and himself an Altered Hour) and Dan Walsh(drums)'s mantric rhythms. Recently released album-teaser 'Medicated Hope' and 'Surge Protected' both argue strong cases in favour of the band one day releasing a quality post-rock record. 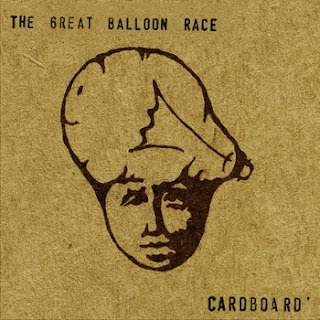 As the unexpected acoustic charms of 'Fish' begin to filter through the speakers, it's clear that an incredible amount of time has been dedicated to nailing the Great Balloon Race live sounds on record. Although admittedly less raucous, the sumptuous tones of McNicholas and Marcus Gordon's intricate guitar lines have been pristinely captured by Mac Gabhann with Walsh's kit given room to form an expertly-voiced opinion on the more free-time likes of 'Bhutan' and 'Howard Moon'. With such talented players possibly tempted to pull in various directions, it is McNicholas' understated vocal that threads the individual pieces together; Case in point David O'Regan's accompanying lounge-lizard organ intro to 'Howard Moon', a curveball for this record that evolves into a jam before the vocals return to complete the circle. Versions of the ever so delicate 'Pockets' (one of my favourite songs released by an Irish band in a long time) and the not so timid 'Grog' in all its duelling saxophone glory have become live favourites over the past six months so it's great to hear their seamless transition into the recording world. Following enthralling releases from Trumpets of Jericho, Seti The First and Hope Is Noise (not to mention a Madonna-bashing #1 record for Blarney songsmith Mick Flannery), Cardboard fittingly provides a truly brilliant book-end for an epic year on Leeside.